I figured I should try to swatch my untried Lynnderellas from Early Halloween Resurrected and Sweet Somethings for a Summer Solstice before my new Season's Glitterings preciouses arrive! I've been seeing a bunch of pretty manis with Lynnderella VamPink (from Early Halloween Resurrected) lately, so I decided to wear that today. 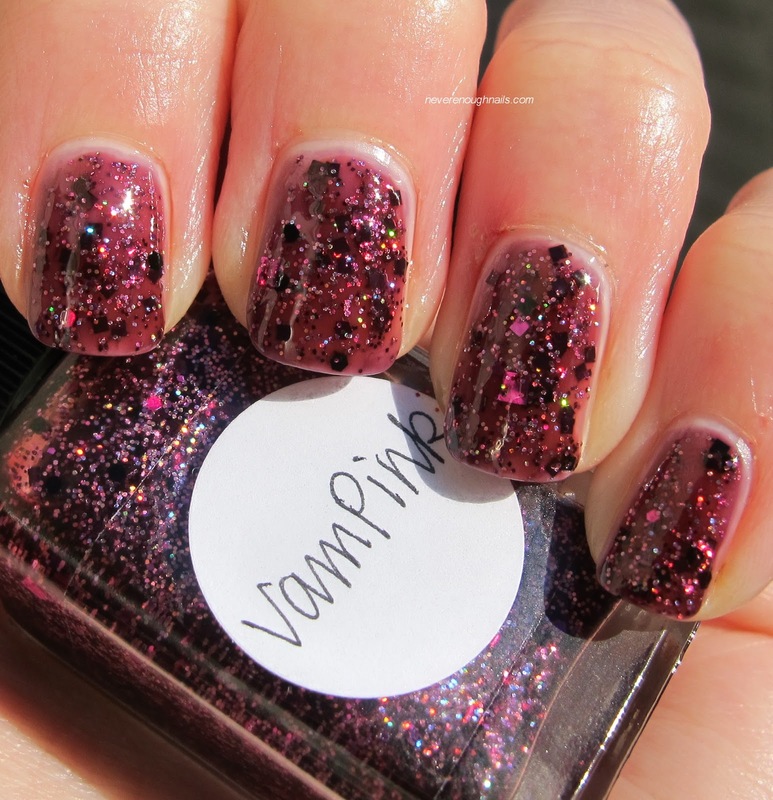 For this look, I layered two coats of VamPink over two coats of Zoya Katherine, a vampy purple jelly. 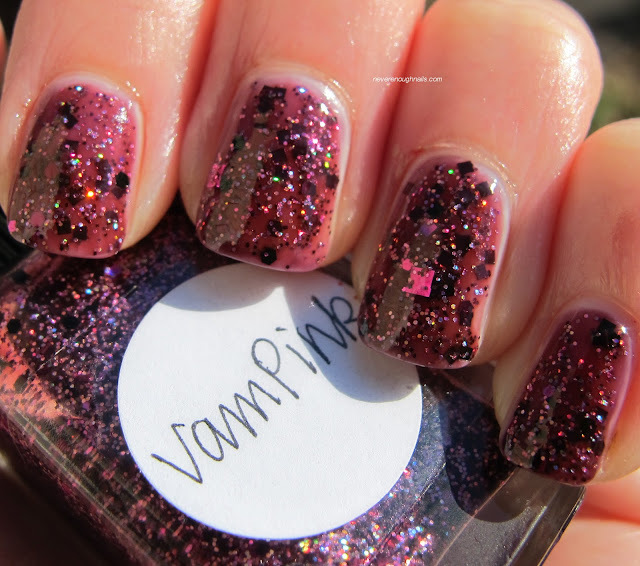 Lynnderella VamPink has a berry purple tinted base, so I'm pretty sure you could actually wear it alone pretty easily. It also contains a TON of magenta, burgundy and small holo glitter, so it could probably be full coverage in 2-3 coats. I thought those large dark square glitters were black by the way, but from Lynn's description, they're probably actually deep burgundy. I love that giant bright pink square on my ring finger!! VamPink was nice and easy to apply. 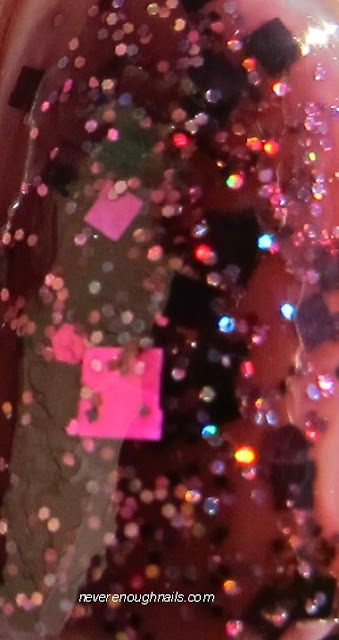 There's so much glitter in there, it's quite easy to get it all on the nail. 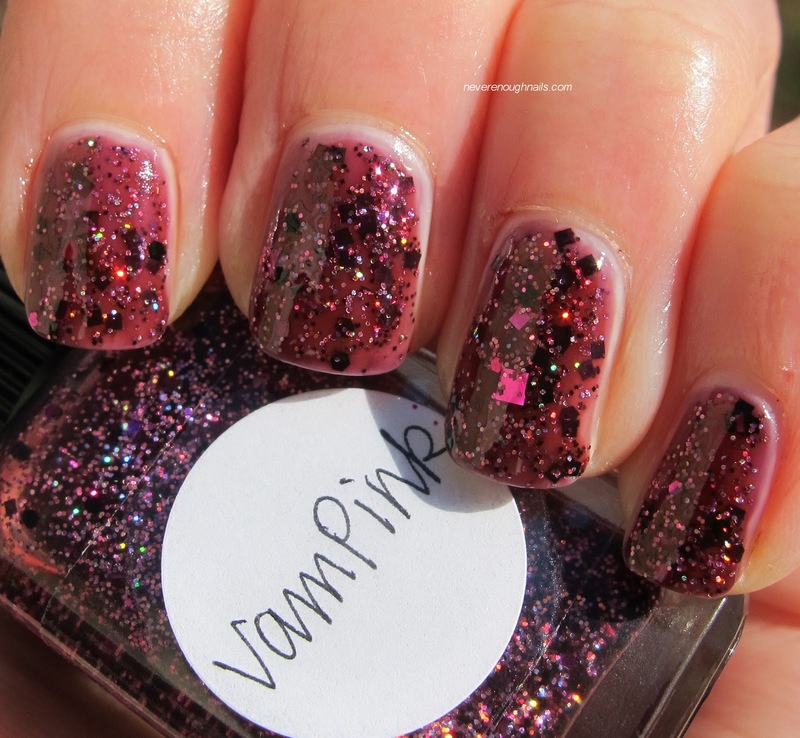 This is two thin coats of VamPink. This is a top coat eater though, and I found two coats of Gelous still left it looking a little dull and didn't let the holo glitter shine through to it's full potential. So I added a third coat of Gelous and then a coat of NYC Grand Central Station just to dry the coats of Gelous. The third coat made this a super shiny and smooth mani and really brought out the holo glitter. I was expecting to like VamPink, but for some reason I didn't think I'd love it. Now that I'm wearing it, I LOVE it. It's so gorgeous!! I almost didn't buy this one and I'm so glad I did. If you haven't seen Lynnderella's new holiday collection, Season's Glitterings, check it out here. I will, of course, have some of those to show you soon! Lynnderella polishes are available on eBay. Remember, you can message her brother Paul on eBay and set up a custom set if you don't see the selection of polishes you're looking for! Thanks TikiBarbie, it was fun to wear! !